Objects created using 3-D printing have a common flaw: They are fragile and often fall apart or lose their shape. 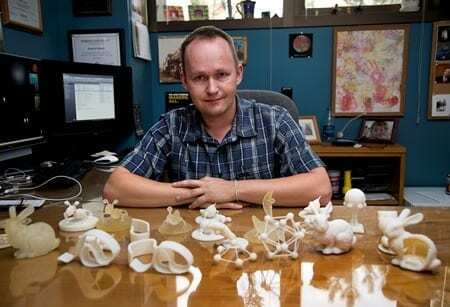 “I have an entire zoo of broken 3-D printed objects in my office,” said Bedrich Benes, an associate professor of computer graphics at Purdue University. The printed fabrications often fail at points of high stress. “You can go online, create something using a 3-D printer and pay $300, only to find that it isn’t strong enough to survive shipping and arrives in more than one piece,” said Radomir Mech, senior research manager from Adobe’s Advanced Technology Labs. The 3-D printers create shapes layer-by-layer out of various materials, including metals and plastic polymers. Whereas industry has used 3-D printing in rapid prototyping for about 15 years, recent innovations have made the technology practical for broader applications, he said. The recent rise in 3-D printing popularity has been fueled by a boom in computer graphics and a dramatic reduction of the cost of 3-D printers, Benes said. Researchers at Purdue and Adobe’s Advanced Technology Labs have jointly developed a program that automatically imparts strength to objects before they are printed. “It runs a structural analysis, finds the problematic part and then automatically picks one of the three possible solutions,” Benes said.